After a favorable “risk on” year that brought numerous new highs to many stock market indices worldwide without significant drawdowns, investors have perhaps become lulled into a state of complacency and security around their investment portfolio allocations. Volatility has been dampened in global markets, whether evaluating the VIX or the MOVE index, with values even lower than before the global financial crisis. Although 2018 marks the 10th anniversary of the crisis, we are still seeing the effects of unprecedented central bank action, especially in bond markets. However, as the global economy gains strength, central banks around the world have ended, or are in the process of concluding bond purchase programs. In the chart below, it is projected that the demand from the 4 largest central banks will actually turn negative by the end of 2018. As private market participants step up to fill this gap, we expect uncertainty in the market with a trend towards increased volatility. Most investors treat bonds as the guardrails of their portfolio asset allocation but looking ahead into 2018 as global markets normalize, concentrated allocations that have performed well in the past may not be the best choice going forward. Yields on both investment grade and high yield credit bonds are close to fair value which may limit the outsized returns we have seen in credit post-financial crisis. Below, we analyze the most important things to watch for in each region. In Australia, as in many markets, inflation has continued to print below target albeit with a slightly positive trend. That said, the RBA appears content with the current state of macro policy settings when balancing longer run financial stability and prosperity against the potential boost to both activity and inflation from further rate cuts. As a result, in the absence of a crisis-driven rate cut, we look for an extended period of stable cash rates, with the next move more likely to be upwards rather than down, but not until at least late 2018. The real economy continues to show resilient growth, with the post-resource boom adjustment in business investment having largely run its course. The main risk focus is the housing market, where a maturing construction cycle is likely to see a diminished contribution to growth. House price growth has also moderated as credit standards have been tightened and household leverage has stabilised, but the threat of a sharp downturn (and flow on impacts to consumer confidence and growth) are generally overstated. US rates have a maintained a range-bound nature throughout 2017. Rates began the year slightly above their current level, touching a high of 2.63 in March, and a low of 2.04 in September, now hovering pretty much at the midpoint of the year’s extremes. There are signs that an end to this stability is at hand. The most important of these signs is short-term measures of inflation, measures which have clearly moved into higher gear since the middle of the year. The market is not anticipating inflation readings of this magnitude, so should they continue, rates are likely to move higher. The noise in economic data should continue to fuel regular bouts of bullishness, which will make for difficult trading. If the Trump administration manages to pass a tax reform package, the movement in rates may be slightly higher, but even then, we do not expect 10-year rates to move beyond 3%. The key question for investors is estimating how much slack the Eurozone has, and the speed at which the above trend growth absorbs it and finally, how quickly this will produce a pickup in wage growth and inflationary pressures. Euro area unemployment rate has been falling at a very rapid 1% per year, reaching 8.9% in September. Such declines in unemployment should create some nervousness in the ECB about rising wage growth and we expect QE to end in 2018. Although political uncertainty is likely to rise in the first half of 2018 with the Catalonian and Italian elections and potentially another in Germany, none of them challenge the very future of the Eurozone like in the case of the French presidential elections, and hence should not upset what looks to be a positive year for the continent. At the lower house elections in late October, the Liberal Democratic Party (LDP) won giving Prime Minister Abe a super majority. This further confirmed that ‘Abenomics’ will remain and the outlook for Bank of Japan policy going forward will evolve with the LDP’s policies. The Bank of Japan (BOJ) remains in a coma. Governor Kuroda’s term ends in April 2018 and until such time as a successor is found or Abe reinstates Kuroda (the current market consensus), no change will occur to the Bank of Japan’s policy of zero interest rates, quantitative easing and anchoring the yield curve. The latter entails keeping the 10-year government bond at or near zero. With inflation currently not yet meeting reaching the 2% target, the BOJ is likely to maintain its easy monetary policy throughout 2018 as a premature exit from easy policy could dampen medium-term inflation expectations. The market environment in 2018 may seem benign but we believe it is important to reconsider your holdings to ensure there are no unintended risks. 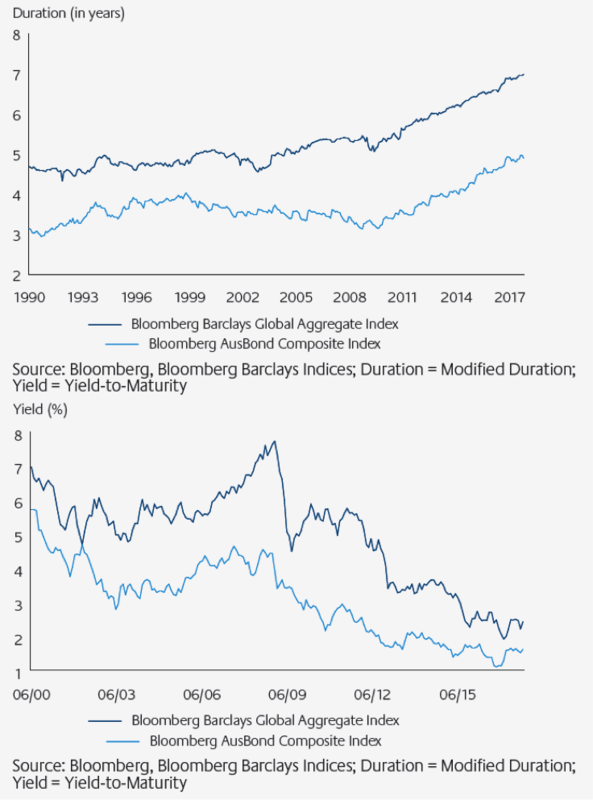 Duration, a measure of interest rate sensitivity, has increased since the global financial crisis in both the Bloomberg AusBond and Global Aggregate bond benchmarks while yields have fallen, so a passive investor is exposed to more risk for less return. While multi-sector bond strategies can work well as the core of the fixed income allocation, we advocate a balanced risk approach to portfolio construction which does not over-concentrate risk in any one factor, whether it be credit, interest rates, or currencies. We believe this approach can ensure your fixed income allocation continues to act like fixed income – lower volatility and correlations to return seeking assets in the portfolio.